As a pool owner, you know your pool requires a lot of care to keep it safe, clean, and performing properly. Skipping pool maintenance isn’t something you can do unless you want to deal with a green pool, unsightly stains, and white rings on your tile. Pool Service Las Vegas is one of the leading Las Vegas pool cleaning companies with a full team of technicians ready to take over your pool maintenance so you can kick back and relax. We can do it all from pool opening and closing to water chemistry maintenance, tile cleaning, and pool cleaning service. You have invested a lot in your pool to give yourself a private retreat and a way to beat the Las Vegas heat. 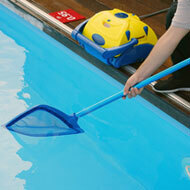 To keep your pool beautiful and ready for use at any time, we offer reliable pool service in Las Vegas. Our pool cleaning company can service your pool on your schedule whether you need one-time service, Las Vegas pool service while you’re out of town, or regular weekly service. No matter how often we arrive, we perform a full pool cleaning in Las Vegas, not just spot cleaning. 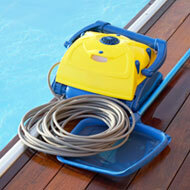 At Pool Service Las Vegas, we make it easy to customize your pool cleaning service to fit your needs. We offer full service and light pool cleaning based on a schedule of your choosing, such as weekly, biweekly, or monthly. With our pool chemical service, you don’t need to worry about testing and balancing the chemicals in your pool to ensure it’s safe and swim-ready. We can help you maintain your pool with water treatment chemicals that prevent harmful bacteria, algae, biofilm, and more. Chemical service can be provided along with regular pool cleaning service in Las Vegas or it can be a standalone service if you just need a little help taking care of your pool. Our Las Vegas pool service technicians will test and balance your pool water every other week. 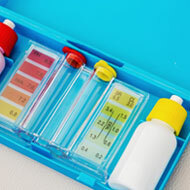 This includes balancing conditioner, salt, pH balancers, and disinfecting chemicals as needed. To keep your pool tile looking its best, consider professional pool tile cleaning. As a leading pool cleaning service in Las Vegas, we use a technique called bead blasting or salt blasting to remove even years of stubborn scale deposits and grime from your pool tile without damage. This technique involves blasting salt or tiny glass beads against your tile to blast away hard water deposits without damaging your delicate tile. 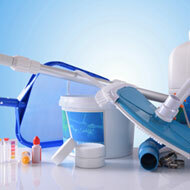 We can clean all types of pool tile, including glass, ceramic, porcelain, and stone. If your pool has stubborn stains or algae growth, the best solution may be a pool acid wash or chlorine bath to make your pool look like new again. Acid washes are an extreme form of cleaning that aren’t designed to be done regularly. This option strips away a very thin layer of your pool plaster using muriatic acid to remove algae, mineral deposits, stains, or dirt for good. Acid washes produce very dramatic results. If your pool has algae that continues to bloom, an acid wash may be the only option. A chlorine bath uses concentrated chlorine instead of acid to restore your pool. While acid washes are used for plaster pools, chlorine baths are used to solve serious algae issues with pebble pools. A liquid chlorine mixture will be applied to the entire surface of your pool and scrubbed to work the solution into the pores. The solution will then be rinsed away. Both acid washes and chlorine baths can solve even the most stubborn algae problems when your pool has become a black lagoon or when the pool is seriously stained. Acid washes and chlorine baths do require draining your pool, however. Neither option is part of routine pool care: these forms of pool cleaning service in Las Vegas are reserved for significant stains or algae.